Dallas Police responded after shots were fired at a Black Lives Matter rally in downtown Dallas. 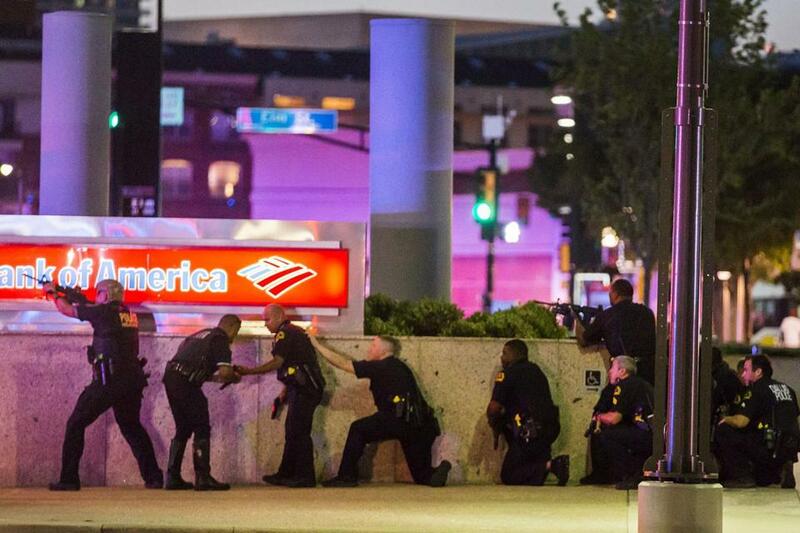 UPDATE: Five officers have been killed in the sniper-style attacks in Dallas. Click here for the latest updates on the story. DALLAS — Four Dallas police officers were killed and seven others were wounded by snipers Thursday night during a demonstration protesting fatal police shootings in Minnesota and Louisiana this week, Police Chief David O. Brown said. Brown said the shooting was carried out by two snipers who fired down on a demonstration downtown that until then had been peaceful. “Some were shot in the back. We believe that these suspects were positioning themselves in a way to triangulate on these officers,” the chief said. All the shot officers were Dallas Area Rapid Transit police. One civilian was also wounded. Police later said in a statement that a suspect who was in a shootout with Dallas SWAT officers was is in custody and a person of interest had surrendered. They said a suspicious package was being secured by a bomb squad. The chief said 10 officers were shot by the snipers, and an 11th was shot during an exchange of gunfire with one of the suspects and was hospitalized. The shooting occurred after President Obama, reacting with the same horror as many Americans to a grisly video of a bloody, dying man in Minnesota who was shot by the police, begged the nation to confront the racial disparities in law enforcement while acknowledging the dangers that officers face. The statements marked a wrenching day that started with widespread replays of the extraordinary video of Castile’s final moments and the aftermath of the shooting, which his girlfriend had narrated as they occurred live on Facebook. There were demonstrations and a vigil for Castile, with appearances by members of his family, in St. Paul. The shooting reverberated far beyond the state, as it revived tensions over the treatment of black people by the police. Demonstrators were out in New York, Los Angeles, Washington, Newark, and Chicago. But it was at the protest in downtown Dallas where violence broke out. The shooting unfolded near one of the busiest parts of the city’s downtown, filled with hotels and restaurants as well as Dallas County government buildings. Videos of the scene flew circulated widely on social media. In many of them, multiple gunshots could be heard ringing out against a city illuminated by sirens. Teams of armed police officers could be seen running through the area. Renee Sifflet, a mother of three teenagers who attended the rally and march, said she lost track of one of her children during the ensuing chaos. ‘‘I brought them here for a positive experience, something they could say they were part of when they’re older, ‘‘ she said. The Dallas Police Department’s Twitter account, which had been tracking the protest’s progress through the city, abruptly stopped tweeting around 9 p.m. local time. A witness told CNN that she had been standing on Main Street shortly before 9 p.m. In Minnesota, Dayton and members of the state’s congressional delegation asked for the Justice Department to investigate the death of Castile, 32, who died hours after the department took over the investigation into another fatal police shooting, also captured on video, in Baton Rouge. The governor said he had spoken with White House and Justice Department officials. But the department responded that for now, it would leave the investigation to the Minnesota Bureau of Criminal Apprehension and would offer assistance. The shootings in Louisiana and Minnesota follow a long string of deaths of black people at the hands of the police — in New York; Cleveland; Baltimore; Ferguson, Mo. ; and North Charleston, S.C., among others — that have stoked outrage around the country. The encounters, many of them at least partly caught on video, have led to intense debate about race relations and law enforcement. Castile’s deadly encounter with the police occurred Wednesday at 9 p.m., in the small city of Falcon Heights, just northwest of St. Paul. The graphic video showed Castile, who had been shot several times, slumping toward the woman who was recording the scene. As she did so, her 4-year-old daughter sat in the back seat and an officer stood just outside the driver’s side window, still aiming his gun at the mortally wounded man at point-blank range. The video is all the more shocking for the calm, clear narration of the woman, Diamond Reynolds, and the fact that she was streaming it live on Facebook. On the video, Reynolds, who said Castile was her boyfriend, gives her account of what happened, saying again and again that he had informed the officer that he was carrying a gun, and that he was just reaching for his driver’s license and registration — as the officer had requested — when the officer opened fire. She estimated, at various times, that three, four or five shots were fired. Reynolds’ daughter appears several times in the video. Near the end of the 10-minute clip, as the two are sitting in the back of a police car and Reynolds becomes increasingly distraught, the girl comforts her mother. Late Thursday night, Minnesota authorities identified the officer who fired as Jeronimo Yanez. They said he is on administrative leave as the investigation continues. Another officer who did not shoot but was on the scene is also on leave. Tthe Hennepin County Medical Examiner’s office ruled Castile’s manner of death to be a homicide, meaning he was killed by another person. In a short statement, the medical examiner said Castile suffered multiple gunshot wounds and died at 9:37 p.m. in a hospital emergency room, about 20 minutes after he was shot. Castile had worked in the nutrition services department of St. Paul Public Schools since 2002 and became a supervisor two years ago, the district said in a statement. In recent years, he worked at J.J. Hill Montessori Magnet School, which is part of the district. In the day after the shooting, Reynolds and her video supplied the only public accounts of the lethal encounter. The officer, who was placed on administrative leave, has not spoken, nor has he been publicly identified. Officials said they could not offer any details, although they did confirm that a gun — presumably Castile’s — was recovered from the scene. Mona Dohman, the state commissioner of public safety, who oversees the Bureau of Criminal Apprehension, declined to say whether Castile had a permit to carry a concealed firearm. Dayton said he was struck by the fact that the video did not show officers making any attempt to render first aid to the dying man but that theyhandcuffed Reynolds and placed her and her daughter in the back of a police car. “The stark treatment I find just absolutely appalling at all levels,” he said. The video of the shooting passed rapidly among Twitter, Facebook and YouTube users, becoming significant news online before traditional media outlets — even those in the Minneapolis area — caught up. The terms #FalconHeightsShooting and #PhilandoCastile were trending on Twitter as news of the encounter spread.